More than 150 years have passed since the apocalypse that nearly destroyed the Earth. Today, the planet is a torn remnant of its former glory, ravaged by nuclear fallout and mutagens. New lifeforms - Mutants and Synthetics - challenge True Humanity for dominance, while warring factions compete for survival and supremacy, and all must carve out their place in this brutal landscape, or else perish as billions before them. 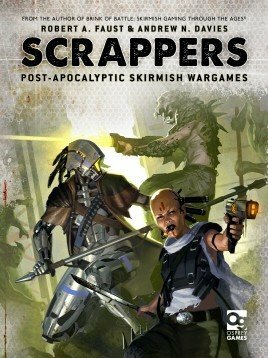 Scrappers is skirmish miniatures game set in the wastelands, where players assemble Scrapper Crews and send them out to scavenge scraps of Ancient technology and battle rival factions. Explorers, cultists and raiders clash with mutated creatures, robotic soldiers and embittered True Humans in this wargame of salvage and survival in the ruins of the future.